This writer had a unique gift for telling it like it is. At the end of each physical therapy session, I get ice and electric stimulation on my shoulder. I lie on my back on one of the tables with my knees bent and my head propped up, and they have posters on the wall for people to look at, posters that I’m sure they perceive as being helpful, if they think about them at all. Please. 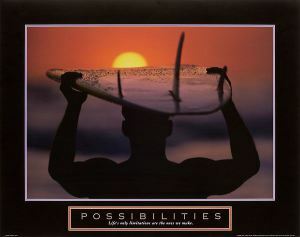 Life is full of limitations that we didn’t make for ourselves, and carrying a surfboard in the early morning sun has absolutely nothing to do with either the sentiment or its patent ridiculousness. Not to mention that for me, the picture, of someone with two normal, perfect shoulders, is almost as upsetting as the sentiment.